VietPress USA (Oct. 4, 2018): U.S. Capitol Police arrested and charged more than 300 protesters Thursday afternoon for unlawfully demonstrating inside Senate office buildings following the FBI's release of a report that found no corroborating evidence regarding sexual assault allegations against Supreme Court nominee Brett Kavanaugh. 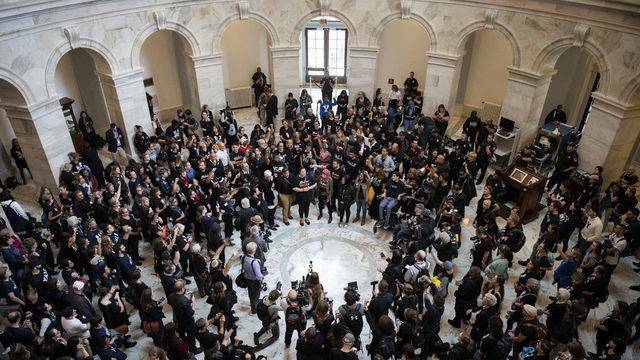 Around 3:30 p.m. local time, police assigned to the Capitol grounds arrested 293 people for crowding, obstructing, or incommoding in the Hart Senate Office Building. 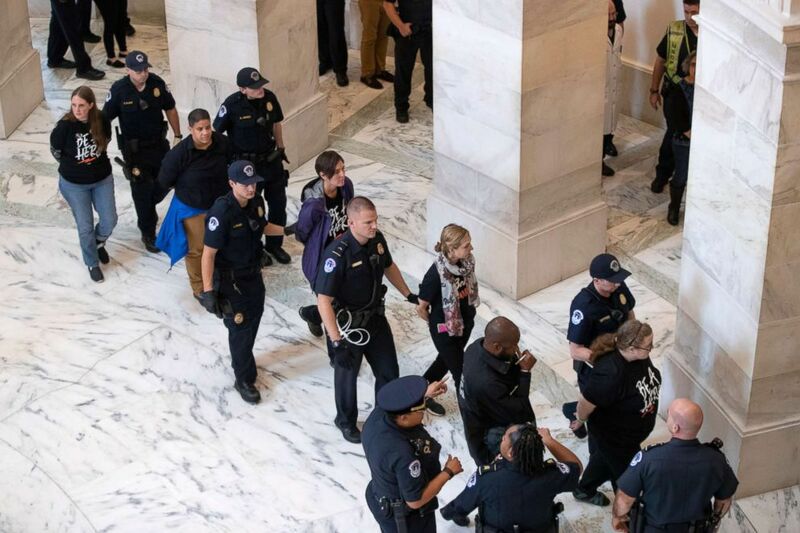 Nearly two hours later, nine more people were taken into custody at the Dirksen Senate Office Building on the same charges. All 100 U.S. senators have offices in either of the two buildings. The Senate is tasked with approving or denying all presidential nominations, including that of Kavanaugh. 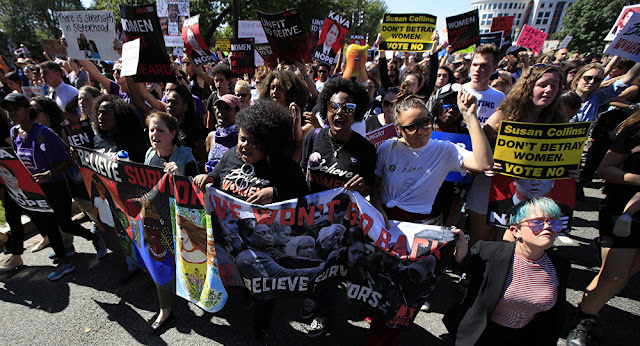 At least 302 anti Kavanaugh protesters arrested on Capitol Hill but the FBI report on sexual misconduct of Supreme Court nominee is "worst fears" because accusers and witnesses were not interviewed. WASHINGTON — Inside a room in the basement of the Capitol, senators grappled with the latest turn in the saga of controversial Supreme Court nominee Brett Kavanaugh: an FBI report on allegations of sexual misconduct against him, prepared over the last week at the behest of a reluctant White House. The report was not available to the public or the press. Its contents remain unknown, even as Kavanaugh’s supporters say it is exculpatory. Detractors have characterized the same report as woefully incomplete. As the full Senate vote on Kavanaugh nears, the public rancor that has surrounded his nomination shows no sign of abating. 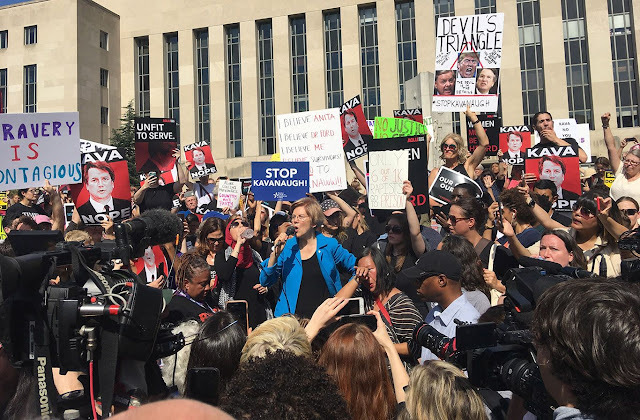 Thousands amassed on Thursday in front of the Pennsylvania Avenue courthouse where, for the past 12 years, Kavanaugh has served as a judge on the D.C. Circuit Court. They bore signs that called Kavanaugh “angry” and “entitled,” in reference to his contentious appearance before the Senate Judiciary Committee last Thursday. “Vote No on Boozin’ Brett,” said a sign hoisted by one woman. Another sign depicted a cartoon rendering of a crying Kavanaugh saying, “I love my beer.” The reference is to Kavanaugh’s avowed fondness for beer. 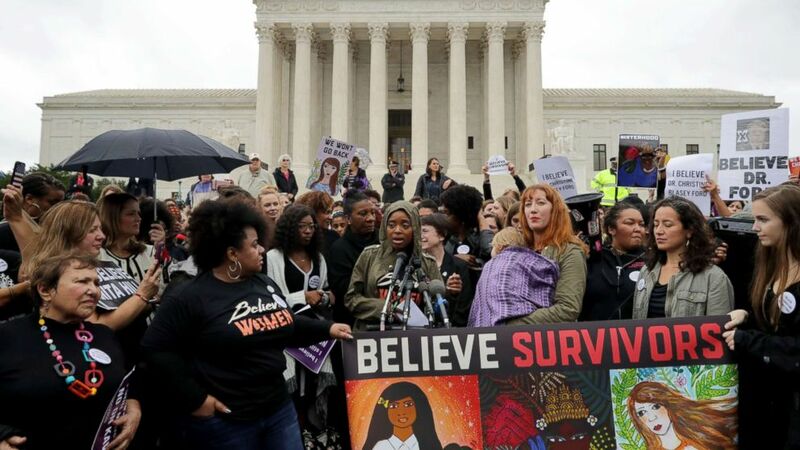 Shutting down traffic, the protesters marched toward the Supreme Court, which earlier this week opened its term with the seat previously occupied by Justice Anthony Kennedy still empty. Republicans hope to change that very shortly. The FBI report on Kavanaugh was provided to senators under conditions seemingly borrowed from a Dan Brown thriller: There was a single copy of the report, and it was made available to senators and a limited number of their staff members on Thursday afternoon. The contents of the report could not be divulged. The White House — which imposed narrow limits on who investigators could question — sought to portray the report as a full exoneration of Kavanaugh, who has been accused of sexual assault by Dr. Christine Blasey Ford and other women. Senate Judiciary Committee Chairman Chuck Grassley, R-Iowa, had much the same message on Thursday morning, declaring that there was “no hint of misconduct” in the new report. Democrats, unsurprisingly, disagreed. In a press conference in the Capitol, Senate Minority Leader Chuck Schumer, D-N.Y., and Dianne Feinstein, D-Calif., the ranking member of the Judiciary Committee, read brief statements as reporters and photographers pressed in around them. “The most notable part of this report is what’s not there,” Feinstein said, an apparent reference to reports that many witnesses who could potentially refute Kavanaugh’s avowals of innocence were not interviewed. Schumer said his “worst fears” about the investigation were realized. Neither senator took questions, underscoring the confusion that has marked the last several days on Capitol Hill. In the bowels of the Capitol, where legislators take subway trains between buildings, reporters crowded around senators, who had no answers. Yet Thursday yielded few surprises. Susan Collins, an undecided Republican vote on Kavanaugh, praised the investigation as “very thorough,” though she said she needed to read it again. Sensing that she might support Kavanaugh, protesters flooded her office. Out on Pennsylvania Avenue, a protester also had a message for the Maine senator written on a placard: “Don’t betray women,” it said. Polling, meanwhile, indicates that Kavanaugh is the least popular Supreme Court nominee in modern American history. A survey of 741 registered voters by Change Research found that 47 percent of respondents hold a very unfavorable view of Kavanaugh. In recent days, his nomination has become a referendum on privilege, gender and, perhaps above all, the staying power of Trumpism. Kavanaugh has become a touchstone for Trump’s base, which is animated less by specific issues than by broader cultural grievance. The fight over Kavanaugh’s confirmation has coincided with growing Republican enthusiasm for the upcoming congressional elections, according to recent polls. Some of those Kavanaugh supporters showed up at the Senate. One group wore pink T-shirts and hats bearing slogans such as “No proof, no truth.” Another group, pro-Kavanaugh women, spoke to reporters outside Collins’s office, testifying to the 53-year-old judge’s upstanding character. But even as the controversial nominee seemed to be heading, however haltingly, toward confirmation, opponents filled the streets of downtown Washington, marching through the unseasonably hot October afternoon in what may be a final bid to stop Kavanaugh.